The craft beer scene is huge these days, and inside many-a brewery lives a dutiful brewery cat who works all day and night warding off vermin and protecting the hops. That beverage your bartender is serving up comes courtesy of protective felines guarding your beer. 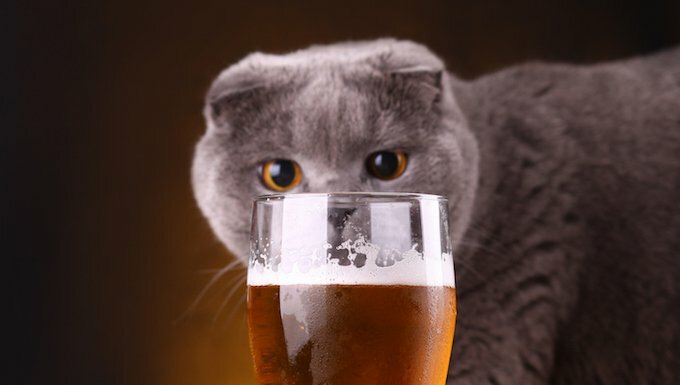 So with Bartender Appreciation Day coming up on December 7th, let’s salute some of the finest craft beer felines who help your bartender keep the drinks flowing. Hoodie is something of a brewery cat superstar. She’s a portly feline who resides at Newburgh Brewing in upstate New York and was originally discovered living under the hood of a brewmaster’s car. These days, Hoodie claims her own line of t-shirts and merch which help spread her fame. Pipeworks Brewery in Chicago hosts a fine clowder of beer cats. The squad is headed up by Kwingston, the brewery’s original resident feline, and also includes Smoose and Craigory (pictured above), who were found trapped inside one of the walls when they were stray kittens. All the cats have since been honored in the artwork that appears on various brews. Teddy is a striking-looking brewery cat who holds things down at West Kill Brewing in the Catskills. When he’s not prowling around the facility, you’ll often find him climbing up on top of giant beer barrels to survey the scene. Citra is a beer cat who spends her days at Saint Benjamin Brewing Company in Philadelphia. This fluffed-up feline gets her name from a type of hops that possesses a strong citrus flavor. Does your local brewery have an in-house beer cat? Are you happy to see felines protecting your brews? Let us know in the comments!